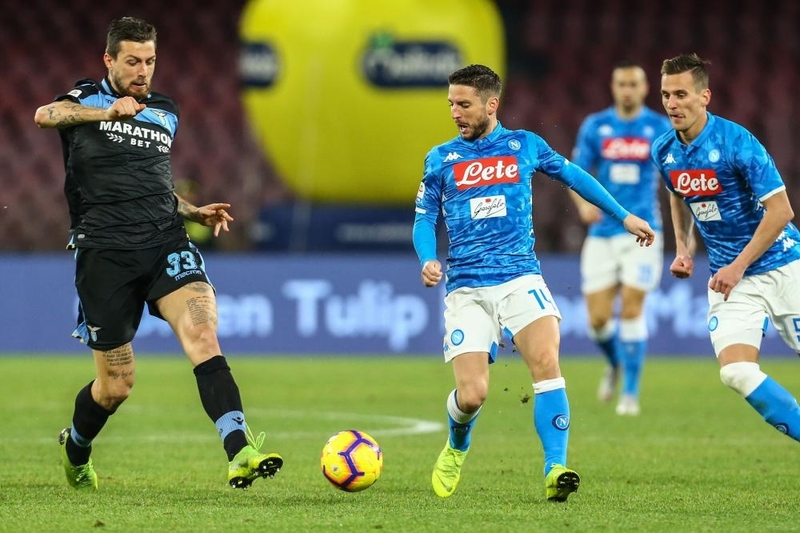 MILAN — Napoli scored twice before halftime and hit the woodwork three times in Sunday’s 2-1 Serie A win over Lazio, which had defender Francesco Acerbi sent off to end his remarkable run of 149 consecutive matches. The win, its 15th in 20 league games this season, left second-placed Napoli six points behind leader Juventus, while Lazio dropped out of the Champions League places. Acerbi had been ever-present since October 2015 in all competitions, firstly for Sassuolo and then for Lazio following his move at the start of this season. After playing 148 matches in a row — staying on the pitch for the full 90 minutes in each — the 30-year-old’s run ended when he was given a second yellow card for a foul on Jose Callejon in the 70th minute. As a result he will be suspended for the next game at home to Juventus. Lazio coach Simone Inzaghi argued, however, that Acerbi should not have been dismissed. Arkadiusz Milik volleyed against the post and then saw a header pushed onto the woodwork by Thomas Strakosha before Jose Callejon fired the hosts ahead with his first goal of the season in the 34th minute. Milik doubled Napoli’s tally three minutes later by curling an exquisite free kick into the top corner. Fabian Ruiz smacked a left-foot shot against the top of the upright early in the second half but Ciro Immobile reduced the arrears in the 65th minute with a shot through the legs of defender Raul Albiol. Napoli, with 47 points, opened up a seven-point gap between themselves and third-placed Inter while AS Roma’s 3-2 win over Torino Saturday took them fourth, the last of the Champions League places, with 33. Lazio is a further point behind in fifth. Moussa Dembele grabbed a stoppage-time winner for Lyon in a 2-1 victory over bitter foes Saint-Etienne Sunday, while Marseille snapped a wretched run of nine games without a win as it beat Caen 1-0 in Ligue 1. Romain Hamouma headed Saint-Etienne into the lead on 21 minutes at the Stade Geoffroy Guichard, but Nabil Fekir converted a second-half penalty to haul Lyon level following a handball by Loic Perrin. An unmarked Dembele headed over in the dying stages after coming on as a substitute, but the forward made no mistake with another chance moments later to floor the hosts in the 95th minute. Lyon goalkeeper Anthony Lopes had earlier pulled off a stunning triple save to keep the visitors in the game, twice denying the in-form Wahbi Khazri before tipping away Hamouma’s follow-up. Saint-Etienne again had a chance to win the match in a frantic goalmouth scramble but Remy Cabella was thwarted by Lopes and Leo Dubois produced a vital block to repel Lois Diony’s subsequent effort. A pitch invasion by angry home fans caused a lengthy stoppage when Lyon won 5-0 last season, and tempers again briefly threatened to boil over following the final whistle Sunday. Lyon climbed back above its rivals into third place after dealing Saint-Etienne a first home loss of the season. Earlier, Marseille recorded a first win since late November despite losing the influential Dimitri Payet to a knee injury after just 24 minutes. Morgan Sanson, on as a substitute for Payet, guided home a header from a Kevin Strootman cross two minutes after the interval to earn Marseille a welcome three points. Caen played most of the second half with 10 men after Frederic Guilbert was dismissed for a second booking. Marseille had faced angry supporters in heated exchanges following last weekend’s 1-1 home draw with Monaco, the culmination of a dismal run that included a humiliating French Cup defeat by fourth-tier amateurs Andrezieux at the start of the month.